Cut the top off the lemons and remove the pulp from inside. Place the pulp in a strainer and squeeze all the juice out using the bottom of a glass. Save the empty lemons for serving. 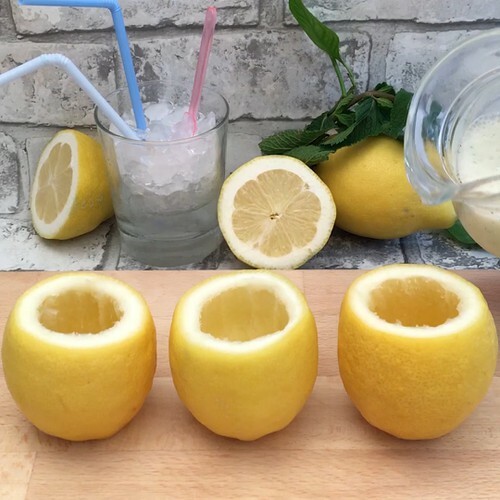 Spread the lemon juice evenly between the wells in the ice cube tray, filling them ²⁄³ full. Add vodka, a few drops of honey and a mint leaf into each compartment to fill the tray completely. Place the ice cube tray in the freezer for 1 hour to form the lemon ice cubes. Place the whole lemons in the freezer as well. Remove the ice cubes from the freezer and place them in a jug. Pour the prosecco into the jug and mix everything together to create a slushy. Pour the lemon vodka slush back into the whole lemons to serve. Cheers!